It's easy! All you have to do is register and submit a recipe. Submit one of you favorite holiday recipes. 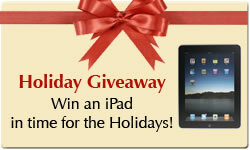 We'll store it in your recipe box and enter you in a random drawing to win an Apple iPad. You can enter as many times as you want. Hurry, the promotion ends on December 22, 2010! Everything you need to know from buying your turkey to carving it. We have what you need to know to make your guests gobble with delight. Step-by-step instructions on how to make your stuffing taste like your mother's.